The International AIDS Society conference began Sunday in DC, the first time the conference has been held in the United States since 1990 because of the now-lifted travel ban on HIV+ people coming to the U.S. That means that 25,000 activists, researchers and clinicians have converged on DC and what seems like a fanciful goal – an AIDS-free generation. Given that donor foreign assistance budgets are increasingly constrained around the world, what gives advocates such hope that a renewed push against AIDS will be successful? 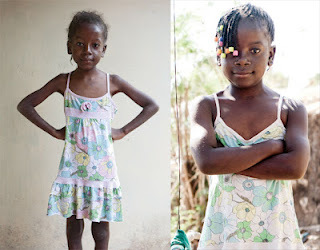 For a disease that lacks a cure, does an AIDS-free generation means an “end” to AIDS? Seizing upon recent studies that suggest that antiretroviral treatment can help prevent the transmission of HIV (one study found a 96% reduction in transmission risk), activists are encouraging a scaling up of treatment as prevention. What this means programmatically is a little unclear, though advocates have identified the goal of putting 15 million people on treatment by 2015. Today, July 24th, activists will be doing their part to put this front and center on the agenda of the policy community through a major protest action. If funding were not constrained, that might be doable. UNAIDS estimates that more than 8 million people are now on treatment in low and middle income countries, up from just 400,000 in 2003. 6.2 million of them are in Africa which has experienced an incredible scale-up of therapy such 56% of those estimated to be sick enough to need treatment now have access to it. (These estimates may be somewhat problematic as the proportion of people “lost to follow-up” can be shockingly high a year or two after people are put on the treatment rolls, perhaps as much as 70% in some projects but certainly not that high for all). UNAIDS also announced that last year the world community spent $16.8 billion on AIDS in low and middle income countries and that half (!) of that money is coming from affected countries themselves. South Africa, the country with the largest number of HIV positive people, has assumed 80% of the costs of treating its citizens since Jacob Zuma took office and reversed the denialism that had previously undermined the country’s AIDS policy under Thabo Mbeki. And, in other good news, CHAI, the Clinton Health Access Initiative, released a study that found that average cost of treating a patient in low and middle-income countries for a year has fallen to $200. This isn’t just about driving drug prices down (which has happened thanks to CHAI even for newer, second-line ARVs) but it’s also due to efficiencies in supply chain management of getting the drugs to the clinics and in task-shifting so that trained local health care workers can carry out some essential duties. Thanks largely to support from Americans of all stripes – Democrats, Republicans, religious leaders, college students, public health officials and the business community – 8 million HIV-positive people around the world now have access to life-saving treatment. The United States is the largest international donor to global AIDS efforts, and for this, the American people should be proud. George W. Bush, whatever his flaws as president (and there were many), deserves enormous credit. Indeed, the former president is spending his energies these days taking on other global health challenges like cervical cancer. Take a look at the data for last year. 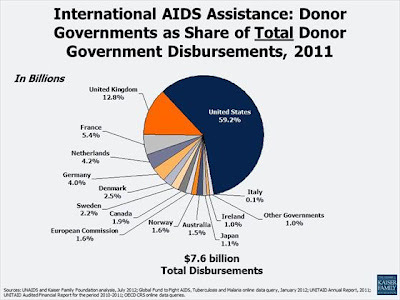 In 2011, if you look at al international donor disbursements, the United States contributed an astounding 59.2% in 2011. With that money, PEPFAR says it is supporting 4.5 million on treatment and is poised to support 6 million on treatment by the end of 2013. 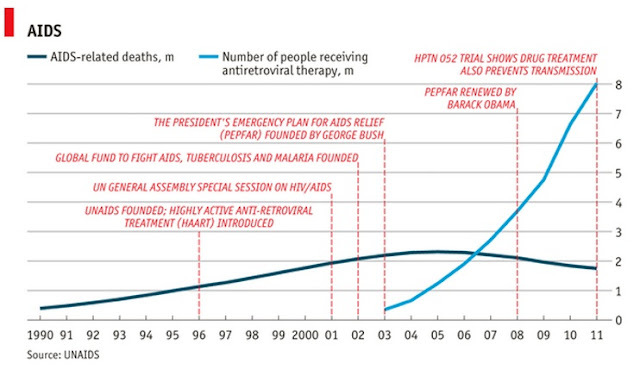 (Note: When the USG says support, it does not mean that PEPFAR supports 100% of the treatment costs. Activist Brooke Baker suggested it was actually about 50%. The not so good news is that there were still an estimated 2.5 million infections last year. And, though that is down by 20% since 2001 and there are lots of countries where the rate of new infections has fallen even faster, the prevention agenda has to be much more front and center. And, notably, donor funding for HIV/AIDS remained flat at 2008 levels. If this goal of 15 million by 2015 is to be met, an additional $2-3bn in resources would be needed per year to reach $22bn by 2015. This also comes at a time when the United States may be facing a huge budget fight over sequestration that could lead to across the board cuts for major programs. Obama’s proposed 2013 PEPFAR budget was already 3% lower than the previous year, the House and Senate topped it up a little bit. If the politics play out wrong, AIDS funding and treatment goals could suffer. Moreover, the economic crisis in Europe has already had some effect on European donations for global AIDS efforts, particularly in Germany and the Netherlands which have seen their contributions slump since 2009. Countries like Italy have never really given much. Outside of Europe, Japan is another rich country that has been miserly on AIDS (though maybe given Fukushima we can cut them a little slack). So, what’s all this talk about an AIDS-free generation? Basically, I think activists are excited to think that with a combination of early treatment, other prevention strategies like male circumcision and universal mother to child therapy, that the next generation will be AIDS-free. It is a time when, first of all, virtually no child anywhere will be born with the virus. Secondly, as children and teenagers become adults, they will be at significantly lower risk of ever becoming infected than they would be today no matter where they are living. And third, if someone does acquire HIV, they will have access to treatment that helps prevent them from developing AIDS and passing the virus on to others. I think what the USG and other donors are hoping is that with rising efficiencies in service delivery and increasing middle income country assumption of the costs of treatment that you can get more for less. However, even with improved efficiencies in the supply chain, I fear that drug prices (at least for first line older drugs) don’t have that much more to fall. Without some infusion of new money, you don’t get much more for little or no new money. You may get less than you want with less than you need. Should We Spend More Money on AIDS? Yes. Last night, the World Bank hosted a vigorous debate that had UNAIDS’ Michel Sidibe and Columbia’s Jeff Sachs in support of more funding for AIDS and CGD’s Mead Over and Roger England taking the opposing position. Over’s position was basically similar to the one Bjorn Lomborg has adopted on climate change, that there are lots of other problems that are equally deserving of attention and where money would go further in saving lives. Now, I know Over has a nuanced position about the need to focus on prevention (which I’m all for), but I fear that economists are a little tone deaf to both the politics and the nature of the disease itself. It’s not as if there is a pot of $25 bn for a bunch of different health interventions and we can choose which ones make most sense. People mobilized on AIDS because millions were dying, overflowing hospitals and treatments existed that could keep them alive. Other diseases don’t have as capable political boosters. And many other health issues like malaria and TB, even primary health, have ridden AIDS’ coattails. Moreover, as Laurie Garrett noted on twitter, for communicable pandemic diseases, you do need specialized funds. You can’t partially address this challenge and then let the situation revert to larger and larger numbers of new infections. And for those 8 million people on treatment (or however many it actually is), we have made a commitment to treat them for the remainder of their lives. If donors and governments renege on such a promise, that is a death sentence and morally unconscionable. However, just treating the people who have it now and doing nothing for those who need it or little more on prevention is not sustainable. While all of the rhetoric about treatment as prevention is compelling, there are some huge logistical and financial challenges. Putting people on treatment early offers immense promise to break transmission but my understanding is that you have to catch it early when people still have high viral load levels and have a higher risk of passing on the virus to their partners. The current approach basically forces people to wait until people they already have had the virus for a while and are sick enough to meet certain thresholds. If you only have a limited amount of money, you would want to get the healthier HIV+ people on treatment early for prevention purposes, but morality dictates that you treat those who are really sick. I don’t have answer other than more money for that. All of this does mean that going forward we have to think strategically about how best to achieve the desired ends given that we have millions on treatment and too many millions of new infections. I still have yet to see what the realistic plan is to break the back of AIDS in a generation, but that’s where we have to go.